Just because we don’t respond doesn’t mean we didn’t see it or discuss it. We are constantly listening and trying to respond to feedback from the community and discuss it internally with the admins or moderators. There is nothing better than a detailed suggestion for the game in our Discord’s suggestions channel. If the suggestion is well-thought-out it is very likely that it will be forwarded to the rest of the team. We discussed both of these tweets (Tweet 1, Tweet 2) from Yhiita pretty heavily internally, but we failed to respond publicly to these ideas. You can vote for a suggestion in Discord by reacting to the message with a star, messages that get enough of these will be added to the the starboard on the server. You can also voice your opinion the topic or just say you agree, this also works. Starting now, we’ll be using a public Trello board that can be used to track current and previous suggestions and their status. You can view the board here and make sure to read the about card! Any actions will logged to the #trello channel on our Discord if you want to keep track there! This is something we want to change in 2018; We wish to increase our communication with you, the community. This is the big one, one of the biggest things we’re gonna tackle. We are going to implement an account system, and along with that a Ranked game mode. We aren’t looking to make Gota a pay to win game where you can purchase mass boosts with money or anything like that. There will be levels, with no level cap. Each level will be harder to level up than the previous level. Levels will have no effect on game play. We don’t have a definite use for the currency that players will be able to earn through playing the game yet, but it will probably be something along the lines of locked name features (color/skin/etc). We would love your suggestions on this topic in particular. Players will also have a profile to show off their stats to other players, along with a simple clan system. With this clan system you’ll be able to see when your friends or clan members are playing Gota.io and on what server (also representing your clan and knowing if someone is the real deal). Of course, Ranked will be a more serious and advanced playing experience compared to a normal match of Gota. One of the main, defining aspects of Ranked will be your rating. As per usual with any type of ranked game-play, this ranking will be subject to change depending on whether you lose or win your match. This ranking will also help you be matched with other players of the same playing level (unless you already have an established party). We hope to incorporate this game mode into many different areas and eventually use it for Tournament-like events. It’s definitely true that new game modes bring life back into games by delivering new experiences to play around with. While we think it would be difficult to constantly deliver new game modes on something like a weekly basis, we want to bring back some of the original game modes such as Powerups or Extreme FFA. We also want add new game modes and updates, and we will begin coming up with some of our own, but please share your ideas with us! Skins has been a vital part of Gota.io since the beginning, and the Skins have come a long way with the original method being posting a thread to the forums and having a moderator upload it for you. We later evolved to our current system allowing users to submit skin requests and have them placed into a queue system to be later reviewed by a skin moderator. Sadly, this system just plain out doesn’t work anymore. The communication regarding the result of a skin request is extremely poor and the queues are unreasonably huge (1,500+ consistently). We’ve been working hard behind the scenes to fix that. In Skins 2, you’ll be able to directly upload to the site instead of having to go through a third party. 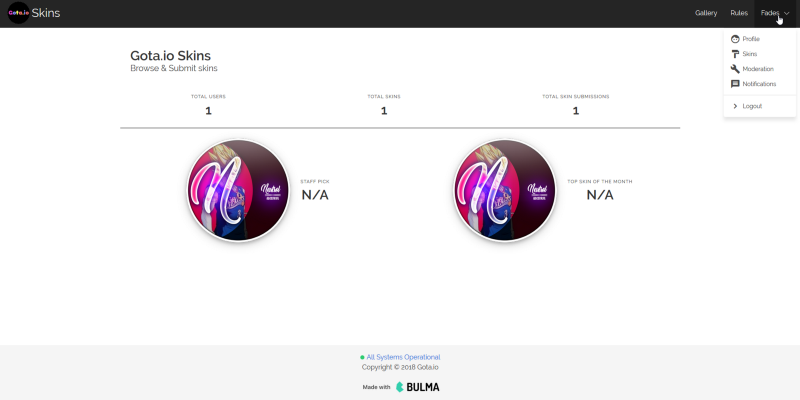 A preview of the skin is available before submitting, and did we mention it’s just way easier. Once you’ve submitted your skin, it can be difficult to keep track of. Currently, the only form of feedback is getting an automated message on the Forums which states whether it was denied or approved with no further information. We’ve come up with a solution to that. Soon you’ll be able to view all current and previous skin requests with their outcome. If the skin was denied you’ll also be able to view a reason provided by one of our Skin Moderators. You can also delete your skins yourself, if the skin was accepted. We also plan to update the game client to better handle the immense skins list, we are aware that some players can have issues loading the entire skin list some times. It wouldn’t be fair not to mention Yhiita who sparked this conversation recently and everyone else in the community that has expressed their opinions and concerns in our Discord.